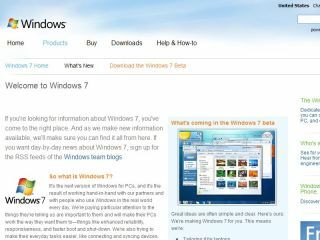 The Windows 7 beta looks likely to be making an appearance soon – with Microsoft updating its official Windows 7 site with a download link. Although the download link currently goes to a 'page not found' page – it seems likely that the changes to the site herald the long-awaited beta version of Vista's successor. Windows 7 is a massive event for Microsoft – which is finding itself put under increasing pressure to deliver a knock-out OS. Windows Vista and its bad press in particular have prompted some to question whether the traditional OS is the future for computing, and even Microsoft is beginning to focus more heavily on the 'cloud'. However, Windows 7 could wrest back some control for Microsoft if it can avoid Vista's early driver difficulties, work better on low-memory systems and still provide the enhanced security of its predecessor. The pre-beta version of Windows 7, which was distributed at Microsoft's recent Professional Developers Conference, suggests that these areas have been successfully addressed. The arrival of Windows 7 is not expected until late 2009, with the majority of pundits betting on an early 2010 arrival. However, the software has been shown off over the past few months, and the arrival of a public beta will spark massive interest from across the globe.